Over the past year I’ve had to have an Atypical mole removed four times. While the wound was healing it needs to be kept moist and the dermatologist office recommended using Vaseline, which is a petroleum based product. It goes through a lot of refining by the time it becomes petroleum jelly, which many sources say means it’s no longer classified as a carcinogenic. While it might not be carcinogenic, that still doesn’t make a good choice. What’s this mean? It means it can disrupt and effect the estrogen process in your body. I personally already struggle with estrogen dominance and for that alone do not use petroleum products. Petroleum jelly doesn’t have any healing properties to it either. If I’m going to put something on a wound, I want it to have properties that not only moisturize my skin (not just act as a barrier) but can help my body promote healing, amen?! 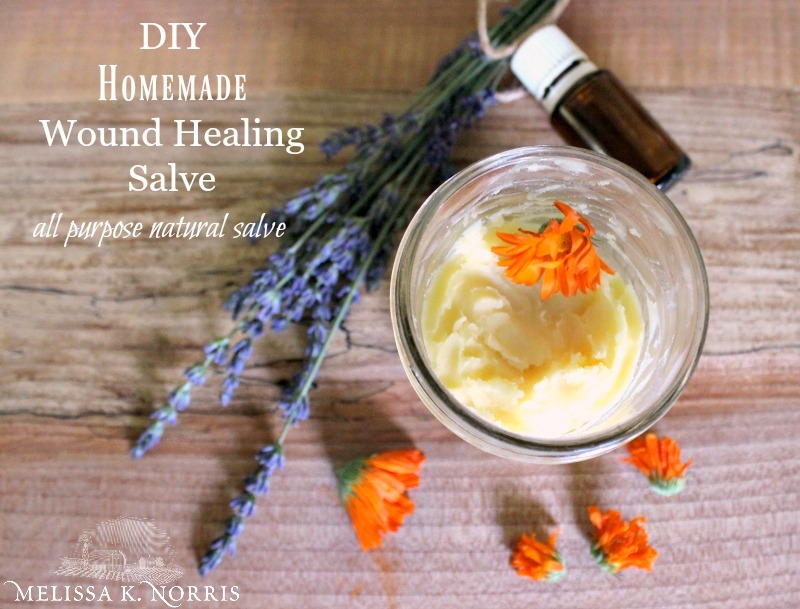 The homesteader in me loves that I can grow the herbs right outside the back door to make this nourishing and healing salve. The essential oils are optional but I chose them specifically for their specific properties in helping to aid the body to heal. You can make any homemade salve recipes without the essential oils and just use herbal infused oils, but I do like to include different essential oils depending on what I want to use the salve for. I use Plant Therapy essential oils, because they have third party testing to verify the quality of their oils (aka haven’t been diluted or cut with anything) and the report is available on every oil, their prices are great (good quality essential oils can be spendy), they have the Kid Safety Seal on all oils that are safe to use with children (because many are NOT), and I can order whenever I want for the best price, no monthly clubs, etc. Plus ALWAYS Free Shipping in U.S! Food scale– when making homemade salves, soaps, and ointments, it’s best to do so by weight and not volume. I’ve used this food scale for over 4 years. 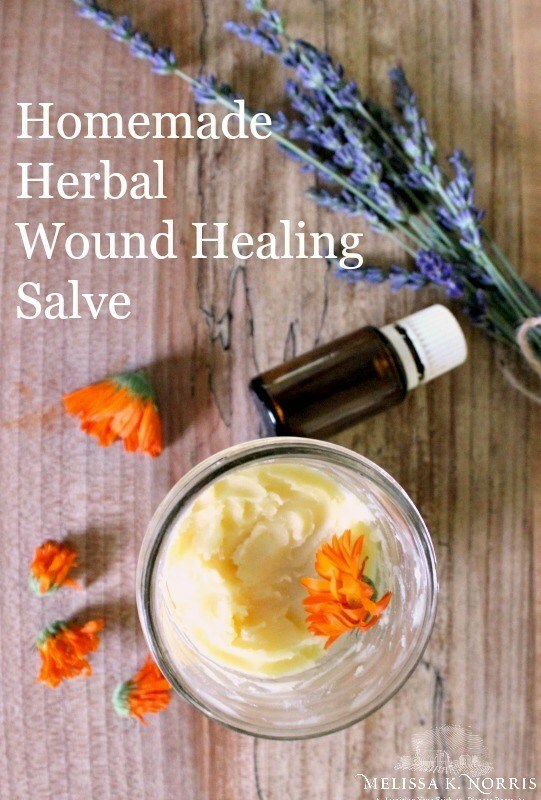 I picked the essential oils to add to my basic wound healing salve recipe based on their healing properties from the book The Healing Power of Essential Oils by Dr. Eric Zielinski. A note on dilution, it’s important that we dilute essential oils before putting them on our skin. This homemade antibiotic ointment is for a short period of time, an acute situation, not something I would use as a moisturizer or on a daily basis long term. The dilution we’re using is 15 drops of essential oil per ounce of carrier, which is still well below a 10% dilution rate. Use a food scale and weigh out your oils and beeswax. Prepare a double boiler. remove from heat and allow to cool before adding essential oils. While salve is cooling, measure out your essential oils. Try to let it cool to at least 120 degrees Fahrenheit or cooler before adding, the trick is to add before it begins to set and harden so you can stir the essential oils in evenly. pour into your container (I like a straight sided glass jelly jar) and let cool. Place a lid on and store in a dark cool area. I found this to be the perfect consistency, soft enough to spread on delicate skin (I scraped all the skin off the base of my fingernail the other day and it was really raw) but even in the heat of summer it didn’t get too soft. You can make it harder by increasing the beeswax, but I would test a small portion of the salve by placing it on a frozen spoon before adjusting the ratios. This salve also smells amazing, proof not all medicine has to smell bad to be effective, hollah! 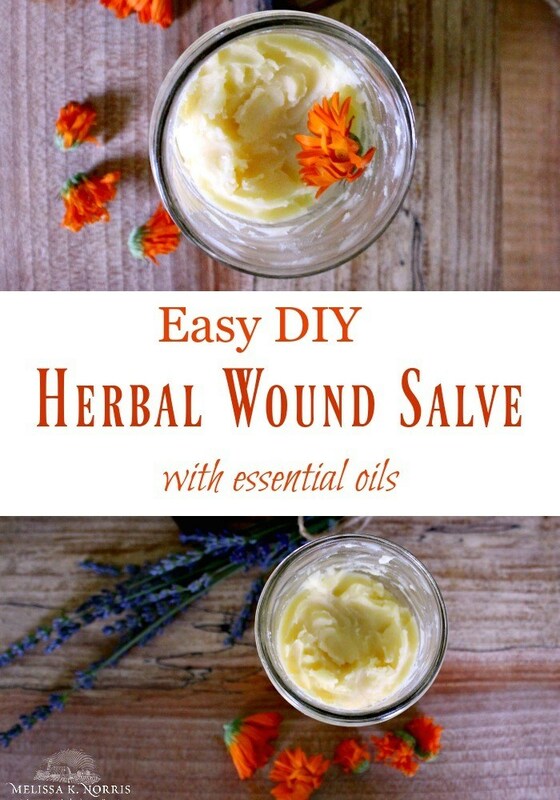 There you have it, an easy herbal wound healing salve, perfect for your natural medicine cabinet.